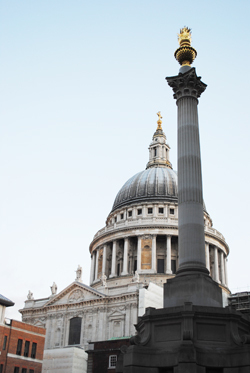 Located just to the north of St Paul’s Cathedral can be found Paternoster Square in the centre of which stands a column. The 75 foot (23.3 metre) tall Corinthian column of Portland stone, which was designed by Whitfield Architects and erected in 2003, is topped by a gold leaf covered flaming copper urn which is lit up at night. While it has been said that the column is “purely decorative”, the developers of Paternoster Square claim on their website that it actually serves several purposes in this case including both commemorative and practical. Not only is it part of the ventilation system for the carpark underneath, they say its design is apparently a recreation of columns designed by Inigo Jones for the west portico of Old St Paul’s Cathedral. 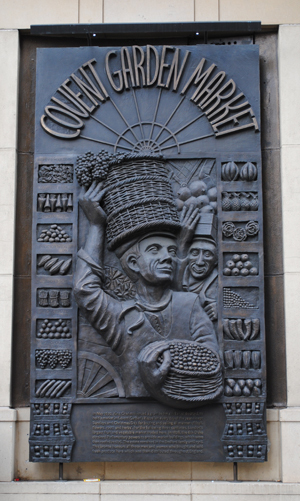 And then there’s the three metre high urn on top which, not unlike that found on The Monument, they say commemorates the fact the site of the square has twice been destroyed by fire – the first time in the Great Fire of 1666 and the second in the Blitz during World War II. 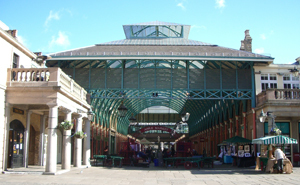 The area around Paternoster Square was once home to booksellers and publishers’ warehouses. Old St Paul’s Cathedral was certainly the largest and most famous casualty of the Great Fire of London of 1666. 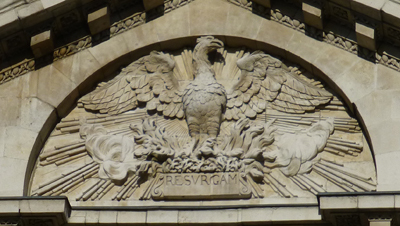 And its passing – and rebirth – is recorded on several memorials, one of which can be found on the building itself. Set on the pediment which, carved by Caius Gabriel Cibber, sits above south portico off Cannon Street, the memorial depicts a phoenix rising from clouds of smoke (ashes), a symbol of Sir Christopher Wren’s new cathedral which rose on the site of the old Cathedral in the wake of the fire. Below the phoenix is the Latin word, ‘Resurgam’, meaning “I Shall Rise Again”. The story goes that Wren had this carved after, having called for a stone to mark the exact position over which St Paul’s mighty dome would rise, the architect was shown a fragment of one of the church’s tombstones which had been inscribed with the word. The foundation stone for the new cathedral, largely built of Portland stone, was laid without any fanfare on 21st June, 1675, and it only took some 35 years before it was largely completed. Some of the stonework from the old cathedral was used in the construction of the new. We should note that the old cathedral was in a state of some disrepair when the fire swept through it – the spire had collapsed in 1561 and despite the addition of a new portico by Inigo Jones, it was generally in poor condition. Stonework from the Old St Paul’s – everything from a Viking grave marker to 16th century effigies – are now stored in the Triforium, rarely open to the public (tours of the Triforium are being run as part of the programme of events being held at the cathedral to mark the 350th anniversary of the Great Fire – see www.stpauls.co.uk/fire for more). A short-lived addition to Old St Paul’s Cathedral before it burned down in the Great Fire of 1666, the classical-style portico was designed by Inigo Jones as part of makeover King James I ordered him to give the cathedral in the first half of the 17th century. St Paul’s, which was completed in the early 14th century in the Early English Gothic style (see our post here for more on its earlier history), had fallen into a state of disrepair by the 1620s, thanks in part to a fire caused by lightning which had brought the spire – 489 feet (149 metres) high when built – crashing down through the nave roof in 1561. The spire wasn’t rebuilt and repair works undertaken to the cathedral roof were apparently shoddy, meaning that by the early 1600s, things were in a parlous state. 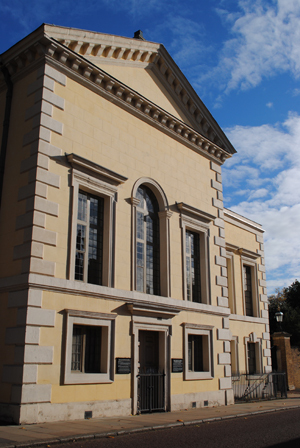 Jones started work in the 1620s, cleaning and repairing the massive structure and adding a layer of limestone masonry over the exterior to give the building a more classical look inspired by the temples of ancient Rome he had seen in that city and in Naples and the work of Italian Renaissance architect Andrea Palladio. This was complemented by the grand portico he added to the west front in the 1630s (and which was paid for by King James’ son, King Charles I). 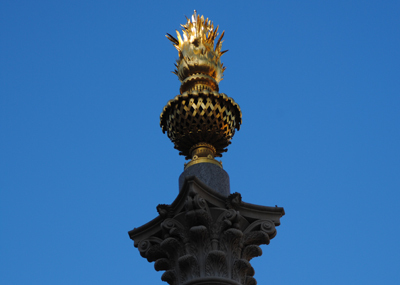 Featuring 10 columns across its breadth and four deep (these, it has been suggested, stood about 45 feet tall), it was topped by a frieze of lions’ heads and foliage with plans for a series of statues which some say were to be saints and others kings to be placed along the top (in the end only statues of King Charles I and King James I were ever placed there). The facade also featured turrets at either side. Work on the repairs came to a halt in 1642 thanks to the Civil War, during which Parliamentarian forces famously used the cathedral’s great nave for stables. Following the Restoration in 1660, with Jones now dead (he died in 1652), Sir Christopher Wren was invited by King Charles II to restore the grand old building but Sir Christopher proposed it be demolished instead, a decision which lead to an outcry among London’s citizens. Wren then changed his plans to instead restore the existing build but replace the spire with a dome. His scaffolding was in place around the cathedral when the Great Fire broke out in 1666 and badly damaged the building (although the portico apparently remained standing until 1687-88 when Sir Christopher had it demolished to make way for his new western front). Interestingly, it is said Wren used blocks from the portico to create the foundations for the building which now stands on the site. 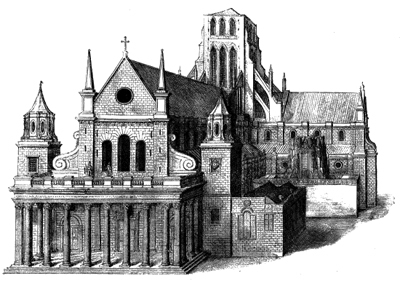 For more on the history of St Paul’s Cathedral see Ann Saunders’ St Paul’s Cathedral: 1,400 Years at the Heart of London . Still on designs for royal palaces and today we’re looking at two designs for the same palace. Both Inigo Jones (1573-1652) and Sir Christopher Wren (1632-1723) drew up designs for the remodelling and expansion of Whitehall Palace. First up was the neo-classical architect Jones who drew up plans for a vast complex of buildings (pictured left) which would replace the Tudor palace King Henry VIII had created when he transformed the grand house formerly known as York Place into a residence suitable for a king (York Place had previously been a residence of Cardinal Thomas Wolsey and prior to that, the London residence of the Archbishops of York). 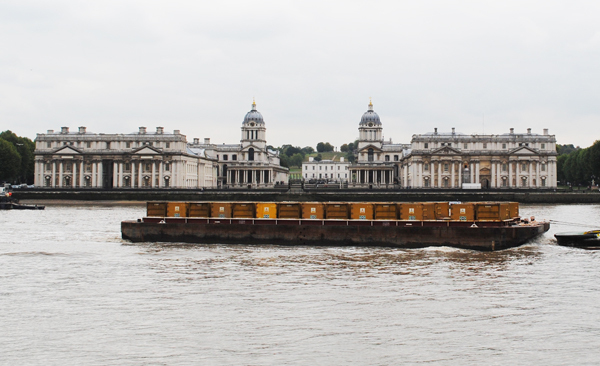 Jones’ complex – which apparently featured seven internal courts – covered much of what is now known as Whitehall as well as neighbouring St James’s Park with a magnificent River Thames frontage. The first part of Jones’ grand scheme – the Banqueting House (see our earlier post here) – opened in 1622. It still survives today – pictured above – and gives a taste of the grandeur of his overall scheme. Yet, despite the eagerness of King James I for the project, it failed to materialise. English Heritage chief executive Simon Thurley told the BBC in 2012 that the hall represented only five per cent of what Jones had planned. King James I died in 1625 and his son King Charles I was apparently keen to continue the project – so much so that Jones submitted new plans in 1638 – but he didn’t find the funds the project needed (and, of course, as we know, then became consumed by the events of the Civil War before being beheaded outside the Banqueting House in 1649). Following the Restoration, in the 1660s King Charles II apparently had Sir Christopher Wren quietly draw up plans to redevelop the palace but these weren’t follow through on although during the reign of King James II he did work on several projects at the palace including a new range of royal riverside apartments, terrace (remains of which can still be seen) and a chapel. 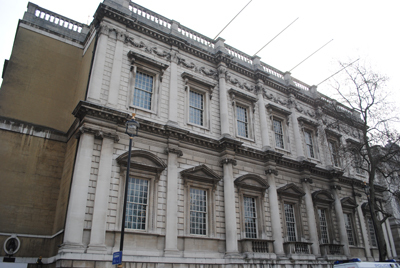 In 1698, much of the bloated Whitehall Palace – then the largest palace in Europe with more than 1,500 rooms – burnt down although the Banqueting House, though damaged, survived basically intact (in fact there’s an interesting anecdote, its veracity questionable, which has it that on hearing of the fire Wren rushed to the site and had an adjacent building blown up to create a firebreak and ensure the Banqueting House was saved). 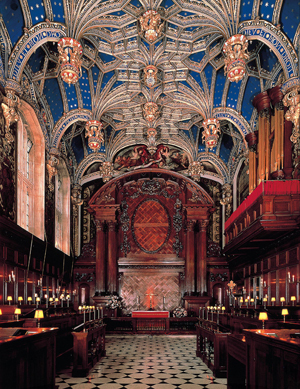 The then king, King William III, approached Wren and he again submitted plans for its rebuilding (prior to the fire, he had already worked on several aspects of the palace including a new range of royal apartments and a chapel for King James II). 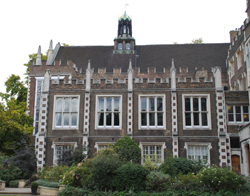 But Wren’s plans – images show a grand domed building – were largely never realised (although he did convert the Banqueting House into a chapel) and the destroyed palace never rebuilt (no doubt in large part due to the fact that King William III preferred a more rural and less damp location – such as that of Kensington Palace – thanks to his asthma). 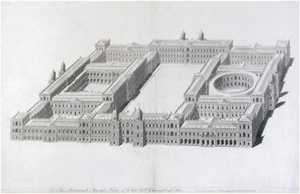 For more on the history of the Palace of Whitehall, see Simon Thurley’s Whitehall Palace: The Official Illustrated History . Often noted as the second greatest English dramatist of his generation (after that Shakespeare guy), the playwright Ben Jonson stands tall in his own right as one of the leading literary figures of the late 16th and early 17th century. Born in 1572, Jonson was educated at Westminster School in London and possibly went on to Cambridge before he started work as a bricklayer with his stepfather and later served as a soldier, fighting with English troops in The Netherlands. It was on his return to London that he ventured into acting – among his early roles was Hieronimo in Thomas Kyd’s The Spanish Tragedie – and by 1597 he was employed as a playwright. While one of his early play-writing efforts (The Isle of Dogs, co-written with Thomas Nashe) led to a term of imprisonment in Marshalsea Prison in 1597 (he was also briefly imprison about this time for killing another actor in a duel, escaping a death sentence by pleading “benefit of the clergy”), the following year – 1598 – the production of his play Every Man In His Humour established his reputation as a dramatist. Shakespeare, whom some suggest was a key rival of Jonson’s during his career – is said to have been among the actors who performed in it. Further plays followed including Every Man Out Of His Humour (1599), his only tragedy Sejanus (1603), the popular Volpone (1606) and The Alchemist (1610), and Bartholomew Fair (1614) and it was during these years, particularly following the accession of King James I in 1603, that he became an important figure at the royal court). His political views continued to cause trouble at times – he was again imprisoned in the early 1600s for his writings and was questioned over the Gunpowder Plot after apparently attending an event attended by most of those later found to be co-conspirators – but his move into writing masques for the royal court – saw his star continue to rise. 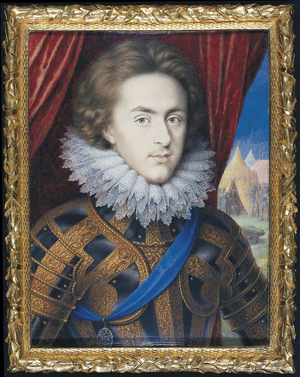 All up he wrote more than 20 masques for King James and Queen Anne of Denmark including Oberon, The Faery Prince which featured the young Prince Henry, eldest son of King James, in the title role. Many of these masques saw him working with architect Inigo Jones, who designed extravagant sets for the masques, but their relationship was tense at times. In 1616 – his reputation well established – Jonson was given a sizeable yearly pension (some have concluded that as a result he was informally the country’s first Poet Laureate) and published his first collection of works the following year. 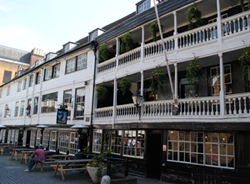 Noted for his wit, he was also known to have presided over a gathering of his friends and admirers at The Mermaid Tavern and later at the Devil’s Tavern at 2 Fleet Street (Shakespeare was among those he verbally jousted with). Jonson spent more than a year in his ancestral home of Scotland around 1618 but on his return to London, while still famous, he no longer saw the same level of success as he had earlier – particularly following the death of King James and accession of his son, King Charles I, in 1625. Jonson married Anne Lewis – there is a record of such a couple marrying at St Magnus-the-Martyr church near London Bridge in 1594 – but their relationship certainly wasn’t always smooth sailing for they spent at least five years of their marriage living separately. It’s believed he had several children, two of whom died while yet young. Jonson, meanwhile, continued to write up until his death on 6th August, 1637, and is buried in Westminster Abbey (he’s the only person buried upright in the abbey – apparently due to his poverty at the time of his death). For an indepth look at the life of Ben Jonson, check out Ian Donaldson’s Ben Jonson: A Life . • The sights and sounds of the elaborate masques of the early Stuart Court – described as a cross between a ball, an amateur theatrical, and a fancy dress party – are being recreated at the Banqueting House in Whitehall. 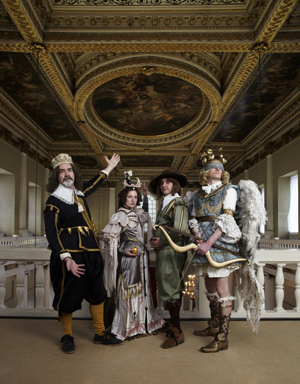 Historic Royal Palaces have joined with JB3 Creative to create an “immersive theatrical experience” for visitors to the building – one of the last surviving parts of the Palace of Whitehall – with the chance to try on costumes, learn a masque dance and witness performance rehearsals for Tempe Restored, last performed in the building in 1632. Inigo Jones will be ‘present’ as masque designer to talk about his vision for the performance. 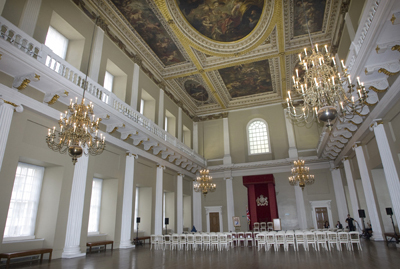 Weekends will also see musicians performing period music and on 27th July there will be a one-off evening event at the Banqueting House based on Tempe Restored. Admission charge applies. Performing for the King opens tomorrow and runs until 1st September. For more, see www.hrp.org.uk/BanquetingHouse/. PICTURE: HPR/newsteam. • A new exhibition looking at how some of London’s great Georgian and Victorian buildings were lost to bombs and developers before, after and during World War II – and how people such as poet John Betjeman campaigned to save them – opened in the Quadriga Gallery at Wellington Arch near Hyde Park Corner yesterday. Pride and Prejudice: The Battle for Betjeman’s Britain features surviving fragments and rare photographs of some of the “worst heritage losses” of the mid-20th century. They include Robert Adam’s Adelphi Terrace (1768-72) near the Strand, the Pantheon entertainment rooms (1772) on Oxford Street, and Euston Arch (1837). The English Heritage exhibition runs until 15th September. Admission charge applies. For more, see www.english-heritage.org.uk/daysout/properties/wellington-arch/. • IEDs (Improvised Explosive Devices) will be ‘uncovered’ in a new exhibition opening tomorrow at the National Army Museum. Unseen Enemy will tell the stories of the men and women in Afghanistan who search for, make safe and deal with the impact of the IEDs through personal interviews, images and mementoes. The exhibition has been developed with “unprecedented access” from the British Army, Royal Air Force and Royal Navy and will include a range of equipment used in detecting and disarming the devices, such as bombsuits and robots as well as medical equipment used to help those injured in explosions. The exhibition is free. For more, see www.nam.ac.uk. • On Now: Club to Catwalk – London Fashion in the 1980s. This exhibition at the V&A explores the “creative explosion” of London fashion during the decade and features more than 85 outfits by designers including John Galliano, Vivienne Westwood and Katherine Hamnett as well as accessories by designers such as Stephen Jones and Patrick Cox. While the ground floor gallery focuses on young fashion designers who found themselves on the world stage, the upper floor focuses on club wear, grouping garments worn by ‘tribes’ such as Fetish, Goth, High Camp and the New Romantics and featuring clothes such as those worn by the likes of Boy George, Adam Ant and Leigh Bowery. The exhibition also includes a display of magazines of the time. Entry charge applies. 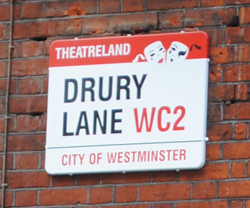 Runs until 16th February, 2014. For more, see www.vam.ac.uk. Meanwhile, tomorrow (Friday) night the V&A will celebrate the 25th anniversary of designer Jenny Packham with a series of four free catwalk shows in its Raphael Gallery. Booking is essential. Head to the V&A website for details. 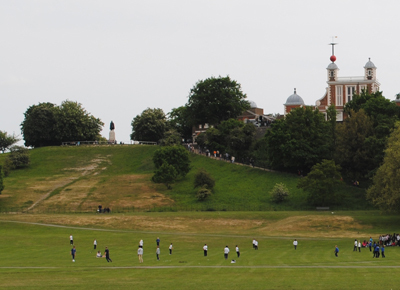 Long an admired landmark of Greenwich, the origins of the Queen’s House go back to the reign of King James I. 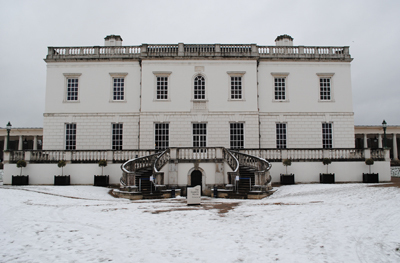 It was the Queen, Anne of Denmark, who commissioned the building of The Queen’s House in 1616 and gave it the name by which it is still known. Sadly, however, she died before it was completed. King James I was said to have been a frequent visitor to the Tudor Palace of Greenwich (the building had earlier been known as the Palace of Placentia and was the birthplace of King Henry VIII in 1491). King James is traditionally said to have awarded the Manor of Greenwich to Queen Anne as an apology after he had publicly sworn at her when she had accidentally shot one of his favorite hunting dogs. 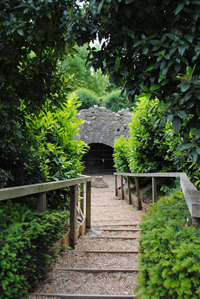 In 1616, Queen Anne decided to build a new property on the site as both a private retreat and a place where she could entertain and it was to the rising star Inigo Jones that she turned to for the design (in recognition of his growing status, he was appointed Surveyor of the King’s Works the following year). 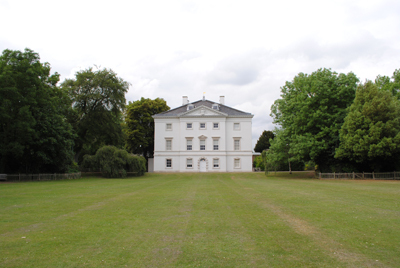 The house was Jones’ most important job to date and the design he came up – based on a H with the two sides joined by a bridge over the Greenwich to Woolwich road – with is said to be the first Classical building in England. Among the original features which survive to this day are the striking black and white geometrically patterned marble floor of the Great Hall (the room having been designed as a perfect cube), the painted ceiling of the Queen’s Presence Chamber and the iron balustrade the Tulip Stairs – said to be the first “geometric self-supporting spiral stair in Britain”. Queen Anne became ill in 1618 and died the following year without seeing the end result of her commission. The work subsequently was shelved and only restarted (and completed in 1638) after King Charles I gave it to his wife, Queen Henrietta Maria. She only had possession for a short time before Parliamentary forces seized it during the Civil War. 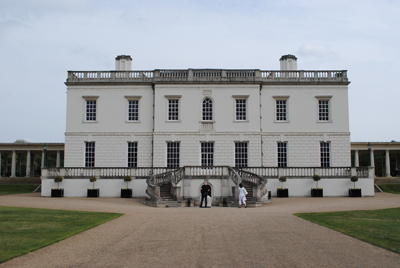 After the Restoration, the Queen’s House was returned briefly to her by her son King Charles II (it was at this time that the original H-shape of the house was altered to a square) before part of it as later used as studio for painters and then as grace and favor apartments. 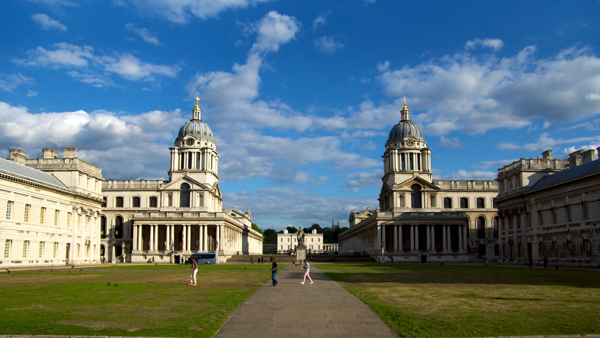 With the Old Royal Naval College now occupying the surrounding site, in 1805, King George III gave the property to the Royal Naval Asylum – a charity caring for the orphan children of seamen – and it later became part of the Royal Hospital School. The National Maritime Museum took possession in 1934 and the building now houses the National Martime Museum’s collection of fine art. As an interesting aside, there have been several reported sightings of ghosts in the house, the latest as recently as 2002.